Just 7 years ago, Chicago launched its first food and wine event known as Chicago Gourmet. This past weekend, Bon Appetit presented Chicago Gourmet, a celebration of food and wine, showcasing more than 190 of Chicago’s finest restaurants and chefs, as well as hundreds of renowned vintners, spirit makers and premium breweries from around the world. If you are into the food scene, you may already be familiar with food and wine shows that are held in Aspen or South Beach. They are shows filled with exciting restaurants, chefs both local and national and trends in the wine and food industries. They offer cooking demonstrations and educational series relative to the food and wine business. If you asked me for a word to describe this event, I would say “energy”! And lots of it. When you first walk in the gates, you are given your bag filled with maps and brochures and of course, your wine glass. While getting the lay of the land or waiting in lines, happily smiling employees of Stan’s Donuts were offering caramel glazed donuts filled with creamy cheddar cheese and a cheese popcorn kernel sitting on top reminding you instantly of Garrett’s Popcorn (aka Chicago Mix) caramel and cheese popcorn notoriety. The weekend weather was perfect, as the show was held in Chicago’s Millennium Park just off our famed Michigan Avenue and adjacent to Lake Michigan. When you looked around the grounds, you see tents with small lines and long lines. Those with the long lines were typically the Chef Tasting Pavilions where about 4 chefs from local restaurants prepared a dish to share with the attendees. Something to remember for next year is to plan ahead which chefs, restaurants, vineyards and seminars you wanted to visit and create a schedule surrounding those timeframes keeping in mind the inevitable lines. The brochures that were in our bags gave us the locations and times for each Chef which was helpful. I thought this woman had such a clever way of holding on to her wine glass…. On Sunday, there were 10 Chef Tasting Pavilions. There was no skimping on flavors, creativity and taste at these tables that is for sure. The two Chefs tables that seemed to have the longest lines were for the Supreme Lobster and Seafood Co. Pavilion and the Dessert Chef Tasting Pavilion. And for good reason. The food was wonderful. Dirk’s Fish Market (http://www.dirksfish.com/) made a shrimp taco with jalapeno cream that was out of this world. There were many satisfied faces as we waited in line for the next table for those eating BBQ brisket sandwiches from Q-BBQ (http://www.q-bbq.com/). If you were ready for sweets, breads, chocolate or coffee, they were all there for you too. The variety of meats, fish, poultry, rice, pasta, fruits, vegetables and other ingredients was extensive. Even at an outdoor venue, presentation still mattered. Pride in the dishes each chef presented was so evident as they handed each guest a plate and then offered a description of what they had created. That also explains somewhat the length of time waiting in line. Another passed around treat was s’mores in an ice cream cone. How fun of an idea is that?! There were offerings of Wisconsin cheeses, fresh sliced salumi, and caviar to go along with a line of vodka. On a personal level, I am fascinated by the food presentation, recipes and ingredient combinations but in many cases am unable to eat them as I am not a meat eater. Probably my largest take away from this show, that I really want everyone to know for their own sake, is that restaurants and chefs are willing to accommodate your preferences to the best that they can. I was incredibly impressed with J. Rocco Italian Table and Bar and Avli Estiatorio who, after educating me on what they had made, being told of my inability to eat their dish, offered to give me the side dish that complimented their creation. That was awesome! And then to top that experience off, I was at the Grand Cru and talking to Ryan McCaskey from Acadia about his parsnip and parsley soup when he offered to prepare the soup in a way that I could enjoy it. Wow! None of these Chefs were in their own kitchens but worked with what they had in front of them to make the experience for me so impressive. I have always worried about going to restaurants as I never want to make ordering difficult. These Chefs’ willingness to accommodate someone is very encouraging to me and I thank them tremendously for that. Along with all the delicious foods and beverages that were available to try at Chicago Gourmet, there were also many educational seminars, book signings and cooking demonstrations. In honor of the late Chef, Charlie Trotter, there was a tribute dinner and fundraiser for his Charlie Trotter’s Culinary Education Foundation (http://www.charlietrottersculinaryeducationfoundation.org/) on Saturday night. Friday night’s opening to Chicago Gourmet offered a Hamburger Hop that was a burger competition where 15 chefs competed with the winner chosen by celebrity judges. Guests were able to enjoy their entries along with a variety of beverages. There are so many restaurants that I am looking forward to visiting after this experience, it’s hard to know where to begin. 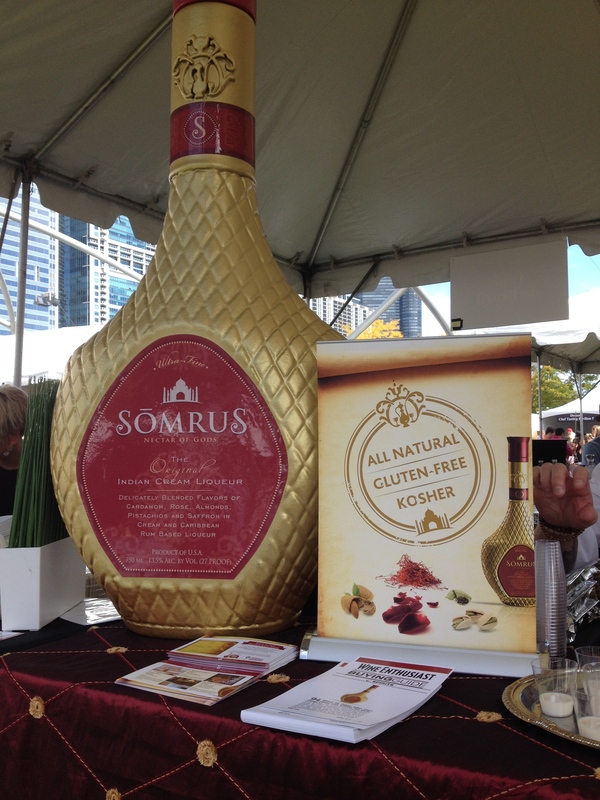 I was introduced and educated on Sake, an Indian Cream Liquer called SomruS, Maille Honey Dijon Mustard with Balsamic Vinegar (brand new to the market! See http://maille.us/news/indulge-with-new-honey-balsamic-mustard/) and so many wines, spirits and champagnes that I will be entertaining and cooking this whole next year just trying them all out. Closing out the night and seeing the darkness set on the Chicago art work known as “The Bean” was the perfect cap to the 2014 Chicago Gourmet experience for me. Stunning. If you attended the show, I’d love to know your favorite spots and discoveries. Oh man, I’m so jealous! That food looks delicious and the wine too, of course! What a fun event! Argh – Chicago is only 2 hours away, we would have loved to attend this! Looks like a great time! I’ve always wanted to go to an event like this. It looks so delicious! Wow! What a selection of food!! The S’mores treat looks so sweet! I like the hanging wine glass too.